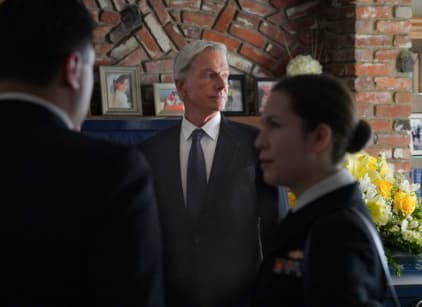 Gibbs is attending a memorial service for a friend, Navy Captain Phil Brooks, when he discovers, much to his shock, that Brooks isn't actually dead at all, just hiding in a fallout shelter. Brooks tells him that someone shot up his boat and attempted to kill him, so Gibbs and his team begin the investigation. They decide to keep Brooks' survival a secret for now, even from his wife. While examining Brooks' laptop, they discover racy photos apparently showing him in a compromising position with a woman, a tenant of one of his real estate properties. Brooks reveals that someone had attempted to blackmail him with the photos, which were forgeries. The woman in the photos tells the team that she suspects a trio of developers that wanted to purchase the property for a major development. When Brooks' wife Marcy catches Torres undercover at the developers' country club, they are forced to reveal Brooks' survival. They eventually connect a boat belonging to one of the developers with the attack on Brooks. The developer, Sean Parks, is revealed to been having an affair with Marcy, who breaks down and agrees to testify against him, as she had no knowledge that he would try to kill her husband to get his hands on the property. Meanwhile, the team deals with their emotional fallout of Reeves' death and Abby's departure. Ducky and his assistant Kasie turn up to help out the team. Brooks: You wanna chime in? Gibbs: The reason you are down here! Brooks: Just told you! Somebody wants me dead. Brooks: I don’t know! That’s why *you’re* here! Gibbs: No, it’s *not*, Phil! It’s not! I am here for your *memorial*! Brooks: What!? It’s only been a few days! Gibbs [in disbelief]: SIX! It’s been SIX DAYS, Phil! Permalink: SIX! It’s been SIX DAYS, Phil! Torres: It wouldn’t be the first time that someone wants to kill their landlord. McGee: You have proof, or you speaking from personal experience?